Ver.1.7 add three kind of fish. Ver.1.7 add night fishing mode. 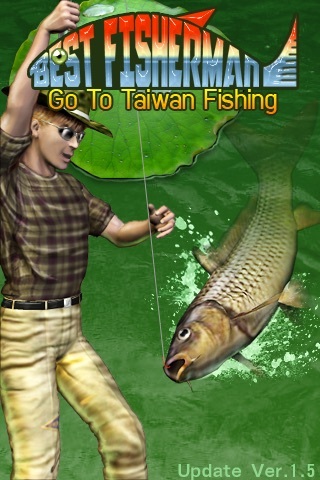 Ver.1.7 add ten fishing tackle items. Ver.1.7 Players click ”Buy Token” with $0.99 to buy 5000 tokens. 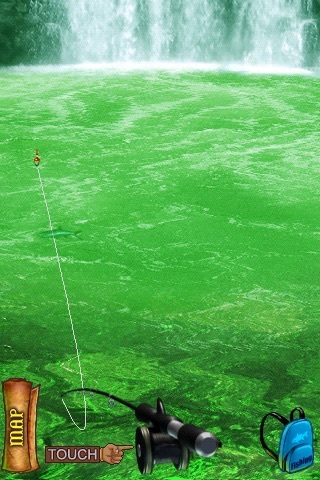 This is a simulation of real creek fishing providing 5 speices of fish for your challange. You can shop your fishing tackle when you enter the shop. Since you don’t have any token, you may not be able to buy them. Now, you can click ”Buy Token” with $0.99 to buy 1000 tokens. Once you have these tokens, you can buy whatever you want. 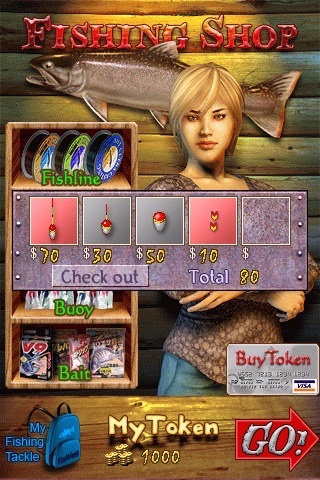 If you are not interested in any fishing tackle, you can directly click ”GO!” to start the game. There are some default fishing tackles for you,So maybe you can't catch big fish. You have to touch the location you are heading for fishing on the Fishing Field. There are six locations in the menu and different fish in speices and size in each location. On the Fishing, you can to open Fishing Tackle to adjust your combination of tacklesand then go back to Fishing. Now you can swing your iPhone as you are swinging the fishing pole. When you look at iPhone afterward, you will see the float landing on certain place and starting floating down stream. When it floats to the edge of the frame, it will be risen and wait for you to pull it and swing your iPhone again. You can also press on ”Touch” while the float is still floating to pull it back and swing iPhone again. 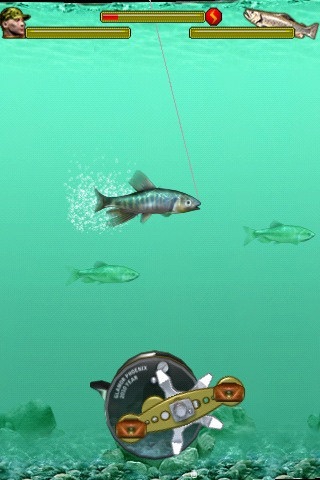 When fish is eating the bait, please press on Touch to hook the fish and the image will change to Fight. All you need to do is rotation the ”reels” to control and balcane your and fish’s power, or the line will broken or fish would escape. All fish you caught can be exchanged as tokens. Please go back to the shop and exchange. If you click ”home” and leave the game, all your score will be lost. You can upload your every day total score to OpenFient and open ”charts” to see your world ranks.